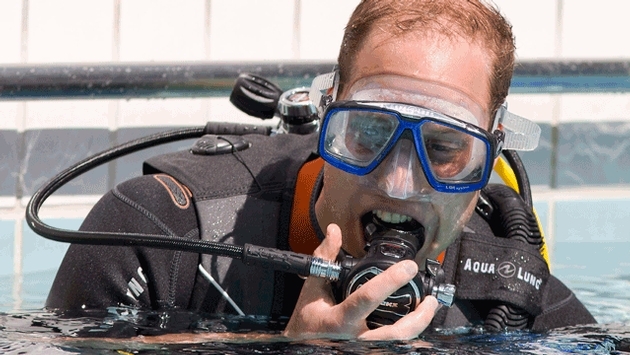 Last week, Prince William did some SCUBA diving at the Oasis Sports Centre in Covent Garden, London in honor of taking over his father’s post as president of the British Sub-Aqua Club. That got us thinking around the office, where would we scuba dive if we were in a land-locked state? Here are a few places that can get you your fix until the next trip to the Caribbean. Yabetchya, Wisconsin! The land of cheese has a great spot for SCUBA. About 25 miles north of Milwaukee is the little town of Port Washington, right on the shores of Lake Michigan. There are no less than four shipwrecks that you can dive going out of the Port Washington Marina including the Northerner, a two-masted schooner that transported lumber until it sank on its way in for repairs in 1868. If you end up here and don’t SCUBA, there are two lighthouses to check out and a bunch of quaint shops and restaurants in the historic downtown district. Be on the lookout for Dustin Diamond, Screech from Saved by the Bell, who makes his home here. Moving South around the lake we next come to Highwood, Illinois, just about 20 minutes North of Chicago. SCUBA here may be a little colder in the winter than the Virgin Islands, but it does exist. Check out the wreck of the Ps Lady Elgin, a wooden-hulled side wheel steamship that sank after she was rammed by the schooner Augusta in 1860. The sinking of the Lady Elgin resulted in the loss of about 300 lives and remains the greatest loss of life on open water in the history of the Great Lakes. Although divers must obtain permission from Harry Zych and the Lady Elgin Foundation to dive the site, the ship easy to reach as it sits in only about 50-60 feet of water. The best part of SCUBA Diving here is that you are so close to authentic Chicago Dogs, Pizza, and one of the Best Polish Communities in the nation (Ok, so maybe that only appeals to me because I am Polish). I know it sounds unlikely, but where would you go to see a 6x6 Truck, an airplane, various boats, a helicopter, a helldiver plane, a school bus, a tanker and a trolley…oh, and they are all underwater? Bethlehem, PA of course! The Dutch Springs Resort has been welcoming visitors to their spring-fed lake since 1980. Originally a cement/limestone mine, the lake now holds all sorts of interesting sights. If you are anywhere in the Northeast, this is the place to get certified to dive. They offer numerous submerged platforms for testing, crystal clear water, and wrap around activities for the non-divers in your party. One of the most popular days to dive? New Years Eve! They have been ringing in the New Year with 32°F temps for years now. Lake Mead sounds like a great place to dive as soon as you hear about the lake itself: “The accumulated water from Hoover Dam forced the evacuation of several communities.” Although some of those communities are actually exposed right now due to low lake levels, there is still a great deal to see under the water. In addition to the massive amounts of underwater life you will see, there is a rock slide, cavern, a few wooden boats, amazing Gypsum Bed deposits, and a batch plant that was used in the construction of the Hoover Dam. Don’t forget you have Las Vegas just 30 minutes away and if you have never been, read this article. This list of dive locations is just a highlight of the copious amounts of locations that cater to divers away from the ocean. There is no excuse if you want to dive in a land locked state. You may not be royalty, but under the water, we all look the same.